Search Results for "the little chef"
A happy little chef chef sits on a table and plays with metal spoons, mugs. A cute boy laughs and points a finger at the camera. 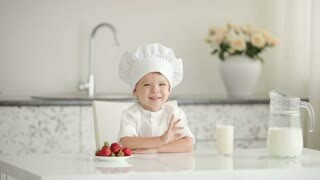 A funny little chef cook sits on a table and plays with raw chicken and flour. 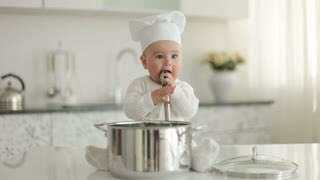 A cute little boy is cooking dinner. The little chef cook is sitting on the table and rolling out the dough. A child in flour plays in the kitchen. 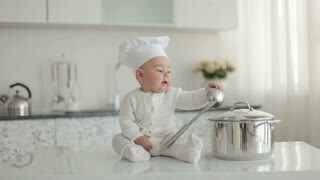 Adorable little chef girl sitting on worktop mixing eggs in bowl with electric mixer while preparing food in domestic kithen. 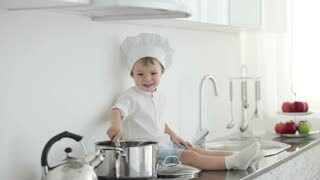 Cheerful elemenatary age child cooking alone in the kitchen at home. Raw pizza tray on table ready for cook with little chef girl standing and checking up for oven, food concept.